For or other kinds of stress, see Stress. "Physiological stress" redirects here. It is not to be confused with physical stress. Physiological or biological stress is an organism's response to a stressor such as an environmental condition. Stress is a body's method of reacting to a challenge. According to the stressful event, the body's way to respond to stress is by sympathetic nervous system activation which results in the fight-or-flight response. Because the body cannot keep this state for long periods of time, the parasympathetic system returns the body's physiological conditions to normal (homeostasis). In humans, stress typically describes a negative condition that can affect a person's mental and physical well-being. Selye demonstrated that stress decreases adaptability of an organism and proposed to describe the adaptability as a special resource, adaptation energy. In recent works, it is considered as an internal coordinate on the "dominant path" in the model of adaptation. Stress can make the individual more susceptible to physical illnesses like the common cold. Stressful events, such as job changes, may result in insomnia, impaired sleeping, and health complaints. Research indicates the type of stressor (whether it's acute or chronic) and individual characteristics such as age and physical well-being before the onset of the stressor can combine to determine the effect of stress on an individual. An individual's personality characteristics (such as level of neuroticism), genetics, and childhood experiences with major stressors and traumas may also dictate their response to stressors. Chronic stress and a lack of coping resources available or used by an individual can often lead to the development of psychological issues such as depression and anxiety (see below for further information). This is particularly true regarding chronic stressors. These are stressors that may not be as intense as an acute stressor like a natural disaster or a major accident, but they persist over longer periods of time. These types of stressors tend to have a more negative effect on health because they are sustained and thus require the body's physiological response to occur daily. This depletes the body's energy more quickly and usually occurs over long periods of time, especially when these microstressors cannot be avoided (i.e.- stress of living in a dangerous neighborhood). See allostatic load for further discussion of the biological process by which chronic stress may affect the body. For example, studies have found that caregivers, particularly those of dementia patients, have higher levels of depression and slightly worse physical health than noncaregivers. Studies have also showed that psychological stress may directly contribute to the disproportionately high rates of coronary heart disease morbidity and mortality and its etiologic risk factors. Specifically, acute and chronic stress have been shown to raise serum lipids and are associated with clinical coronary events. However, it is possible for individuals to exhibit hardiness—a term referring to the ability to be both chronically stressed and healthy. Many psychologists are currently interested in studying the factors that allow hardy individuals to cope with stress and evade most health and illness problems associated with high levels of stress. Stress can be associated with psychological disorders such as general anxiety disorder, depression, and post-traumatic stress disorder. However, it is important to note that everyone experiences some level of stress, and diagnosis of stress disorders can only be performed by a licensed practitioner. It has long been believed that negative affective states, such as feelings of anxiety and depression, could influence the pathogenesis of physical disease, which in turn, have direct effects on biological process that could result in increased risk of disease in the end. However recent studies done by the University of Wisconsin-Madison and other places have shown this to be untrue, it isn't stress itself that causes the increased risk of illness or death, it is actually the perception that stress is harmful. For example, when humans are under chronic stress, permanent changes in their physiological, emotional, and behavioral responses are most likely to occur. Such changes could lead to disease. Chronic stress results from stressful events that persist over a relatively long period of time, such as caring for a spouse with dementia, or results from brief focal events that continue to be experienced as overwhelmingly long after they are over, such as experiencing a sexual assault. Even though psychological stress is often connected with illness or disease, most healthy individuals can still remain disease-free after confronting chronic stressful events. Also, people who do not believe that stress will affect their health do not have an increased risk of illness, disease, or death. This suggests that there are individual differences in vulnerability to the potential pathogenic effects of stress; individual differences in vulnerability arise due to both genetic and psychological factors. In addition, the age at which the stress is experienced can dictate its effect on health. Research suggests chronic stress at a young age can have lifelong effects on the biological, psychological, and behavioral responses to stress later in life. Recent studies have shown that severe psychological stress resulting in PTSD can also significantly affect parenting perception, behavior, neural activity and HPA-axis physiology in response to stressful parent-infant interactions. These recent studies support the existence of intergenerational effects of early chronic psychological stress. The term "stress" had none of its contemporary connotations before the 1920s. It is a form of the Middle English destresse, derived via Old French from the Latin stringere, "to draw tight." The word had long been in use in physics to refer to the internal distribution of a force exerted on a material body, resulting in strain. In the 1920s and '30s, biological and psychological circles occasionally used the term to refer to a mental strain or to a harmful environmental agent that could cause illness. The ambiguity in defining this phenomenon was first recognized by Hans Selye (1907-1982) in 1926. In 1951 a commentator loosely summarized Selye's view of stress as something that "…in addition to being itself, was also the cause of itself, and the result of itself." First to use the term in a biological context, Selye continued to define stress as "the non-specific response of the body to any demand placed upon it". As of 2011 neuroscientists such as Bruce McEwen and Jaap Koolhaas believe that stress, based on years of empirical research, "should be restricted to conditions where an environmental demand exceeds the natural regulatory capacity of an organism". Stress can have many profound effects on the human biological systems. Biology primarily attempts to explain major concepts of stress using a stimulus-response paradigm, broadly comparable to how a psychobiological sensory system operates. The central nervous system (brain and spinal cord) plays a crucial role in the body's stress-related mechanisms. Whether one should interpret these mechanisms as the body's response to a stressor or embody the act of stress itself is part of the ambiguity in defining what exactly stress is. Nevertheless, the central nervous system works closely with the body's endocrine system to regulate these mechanisms. The sympathetic nervous system becomes primarily active during a stress response, regulating many of the body's physiological functions in ways that ought to make an organism more adaptive to its environment. Below there follows a brief biological background of neuroanatomy and neurochemistry and how they relate to stress. The hypothalamus is a small portion of the brain located below the thalamus and above the brainstem. One of its most important functions is to help link together the body's nervous and endocrine systems. This structure has many bidirectional neural inputs and outputs from and to various other brain regions. These connections help to regulate the hypothalamus' ability to secrete hormones into the body's blood stream, having far-reaching and long-lasting effects on physiological processes such as metabolism. During a stress response, the hypothalamus secretes various hormones, namely corticotropin-releasing hormone, which stimulates the body's pituitary gland and initiates a heavily regulated stress response pathway. The amygdala is a small, "almond"-shaped structure, two of which are located bilaterally and deep within the medial temporal lobes of the brain. The amygdalae are part of the brain's limbic system, with projections to and from the hypothalamus, hippocampus, and locus coeruleus among other areas. Thought to play a role in the processing of emotions, the amygdalae have been implicated in modulating stress response mechanisms, particularly when feelings of anxiety or fear are involved. The hippocampus is a structure located bilaterally, deep within the medial temporal lobes of the brain, just below each amygdala, and is a part of the brain's limbic system. The hippocampus is thought to play an important role in memory formation. There are numerous connections to the hippocampus from the cerebral cortex, hypothalamus, and amygdala, among other regions. During stress, the hippocampus is particularly important, in that cognitive processes such as prior memories can have a great influence on enhancing, suppressing, or even independently generating a stress response. The hippocampus is also an area in the brain that is susceptible to damage brought upon by chronic stress. The prefrontal cortex, located in the frontal lobe, is the anterior-most region of the cerebral cortex. An important function of the prefrontal cortex is to regulate cognitive processes including planning, attention and problem solving through extensive connections with other brain regions. The prefrontal cortex can become impaired during the stress response. This has been shown to be the case among post-traumatically stressed mothers in response to video-stimuli depicting mother-child separation versus play and related to a maternal epigenetic signature of the glucocorticoid receptor gene. The locus coeruleus is an area located in the pons of the brainstem that is the principal site of the synthesis of the neurotransmitter norepinephrine, which plays an important role in the sympathetic nervous system's fight-or-flight response to stress. This area receives input from the hypothalamus, amygdala, and raphe nucleus among other regions and projects widely across the brain as well as to the spinal cord. The raphe nucleus is an area located in the pons of the brainstem that is the principal site of the synthesis of the neurotransmitter serotonin, which plays an important role in mood regulation, particularly when stress is associated with depression and anxiety. Projections extend from this region to widespread areas across the brain, namely the hypothalamus, and are thought to modulate an organism's circadian rhythm and sensation of pain among other processes. The spinal cord plays a critical role in transferring stress response neural impulses from the brain to the rest of the body. In addition to the neuroendocrine blood hormone signaling system initiated by the hypothalamus, the spinal cord communicates with the rest of the body by innervating the peripheral nervous system. Certain nerves that belong to the sympathetic branch of the central nervous system exit the spinal cord and stimulate peripheral nerves, which in turn engage the body's major organs and muscles in a fight-or-flight manner. In addition to the locus coeruleus existing as a source of the neurotransmitter norepinephrine within the central nervous system, the adrenal gland can also release norepinephrine during a stress response into the body's blood stream, at which point norepinephrine acts as a hormone in the endocrine system. 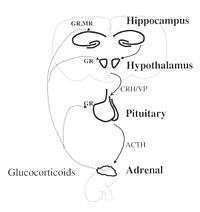 Corticotropin-releasing hormone is the neurohormone secreted by the hypothalamus during a stress response that stimulates the anterior lobe of the pituitary gland by binding to its corticotropin-releasing hormone-receptors, causing the anterior pituitary to release adrenocorticotropic hormone. Adrenocorticotropic hormone is the hormone secreted by the anterior lobe of the pituitary gland into the body's blood stream that stimulates the cortex of the adrenal gland by binding to its adrenocorticotropic hormone-receptors, thus causing the adrenal gland to release cortisol. Cortisol is a steroid hormone, belonging to a broader class of steroids called glucocorticoids, produced by the adrenal gland and secreted during a stress response. Its primary function is to redistribute energy (glucose) to regions of the body that need it most (i.e., the brain and major muscles during a fight-or-flight situation). As a part of the body's fight-or-flight response, cortisol also acts to suppress the body's immune system. Norepinephrine is a neurotransmitter released from locus coeruleus when stimulated by the hypothalamus during a stress response. Norepinephrine serves as the primary chemical messenger of the central nervous system's sympathetic branch that prepares the body for fight-or-flight response. Serotonin is a neurotransmitter synthesized in the raphe nucleus of the pons of the brainstem and projects to most brain areas. Serotonin is thought to play an important role in mood regulation. Stress-induced serotonin dysfunctions have been associated with anxiety, fear and depression-like symptoms. Neuropeptide Y is a protein that is synthesized in the hypothalamus and acts as a chemical messenger in the brain. Traditionally, it has been thought to play an important role in appetite, feeding behavior, and satiety, but more recent findings have implicated Neuropeptide Y in anxiety and stress, specifically, stress resiliency. The peripheral nervous system (PNS) consists of two subsystems: the somatic nervous system and the autonomic nervous system. When a physical stressor acts upon the body the sensory-somatic nervous system is triggered through stimulation of the body's sensory nerves. The signal acts as a nerve impulse and travels through the body in a process of electrical cell-to-cell communication until it reaches the autonomic nervous system. Activation of the autonomic nervous system immediately triggers a series of involuntary chemical responses throughout the body. Preganglionic neurons release the neurotransmitter acetylcholine (ACh). This stimulates postganglionic neurons which release noradrenaline. The noradrenaline flows directly into the bloodstream ensuring that all cells in the body's nervous and endocrine systems have been activated even in areas which the ganglionic neurons are unable to reach. When a stressor acts upon the body, the endocrine system is triggered by the release of the neurotransmitter noradrenaline by the autonomic nervous system. Noradrenaline stimulates the hypothalamic-pituitary-adrenal axis (HPA) which processes the information about the stressor in the hypothalamus. This quickly signals the pituitary gland and finally triggers the adrenal cortex. The adrenal cortex responds by signaling the release of the corticosteroids cortisol and corticotropin releasing hormone (CRH) directly into the bloodstream. The central nervous system (CNS) is made up of the brain and the spinal cord. The brain is equipped to process stress in three main areas: the amygdala, the hippocampus, and the prefrontal cortex. Each of these areas is densely packed with stress corticosteroid receptors which process the intensity of physical and psychological stressors acting upon the body through a process of hormone reception. There are two types of corticosteroid receptors: mineralocorticoid receptors and glucocorticoid receptors. The mineralocorticoid receptors (MR) have an extremely high affinity for cortisol. This means that they are at least partially stimulated at all times and therefore are entirely activated almost immediately when a true stressor is disrupting the homeostasis of the body. The second type of receptor, glucocorticoid receptors (GR), have a low affinity for cortisol and only begin to become activated as the sensation of stress reaches its peak intensity on the brain. Stress dramatically reduces the ability of the blood brain barrier (BBB) to block the transfer of chemicals including hormones from entering the brain from the bloodstream. Therefore when corticosteroids are released into the bloodstream – they are immediately able to penetrate the brain and bind to first the MR and then the GR. As the GR begin to become activated, neurons in the amygdala, hippocampus, and prefrontal cortex become over stimulated. This stimulation of the neurons triggers a fight-or-flight response which allows the brain to quickly process information and therefore deal with life-threatening situations. If the stress response continues and becomes chronic, the hyperactivity of the neurons begins to physically change the brain and have severe damaging effects on one's mental health. As the neurons begin to become stimulated, calcium is released through channels in their cell membranes. Although initially this allows the cells chemical signals to continue to fire, allowing nerve cells to remain stimulated, if this continues the cells will become overloaded with calcium leading to over-firing of neuron signals. The over-firing of the neurons is seen to the brain as a dangerous malfunction; therefore, triggering the cells to shut down to avoid death due to over stimulation. Decline in both neuroplasticity and long-term potentiation (LTP) occurs in humans after experiencing levels of high continual stress. To maintain homeostasis the brain is continuously forming new neural connections, reorganizing its neural pathways, and working to fix damages caused by injury and disease. This keeps the brain vital and able to perform cognitive complex thinking. When the brain receives a distress signal it immediately begins to go into overdrive. Neural pathways begin to fire and rewire at hyper-speed to help the brain understand how to handle the task at hand. Often, the brain becomes so intently focused on this one task that it is unable to comprehend, learn, or cognitively understand any other sensory information that is being thrown at it during this time. This over stimulation in specific areas and extreme lack of use in others causes several physiological changes in the brain to take place which overall reduce or even destroy the neuroplasticity of the brain. Dendritic spines found of the dendrite of neurons begin to disappear and many dendrites become shorter and even less complex in structure. Glia cells begin to atrophy and neurogenesis often ceases completely. Without neuroplasticity, the brain loses the ability to form new connections and process new sensory information. Connections between neurons become so weak that it becomes nearly impossible for the brain to effectively encode long-term memories; therefore, the LTP of the hippocampus declines dramatically. The most important aspect of the immune system are T-cells found in the form of T-helper and T-suppressor cells. Cortisol, once released into the bloodstream, immediately begins to cause division of T-Suppressor cells. This rapid cell division increases the number of T-Suppressor cells while at the same time suppressing T-helper cells. This reduces immune protection and leaves the body vulnerable to disease and infection. 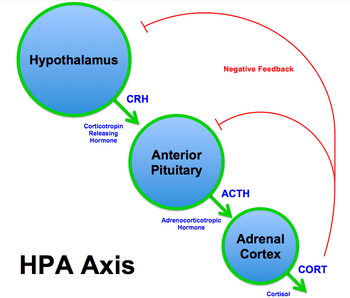 Basic hypothalamic–pituitary–adrenal axis summary (corticotropin-releasing hormone=CRH, adrenocorticotropic hormone=ACTH). When the hypothalamus receives signals from one of its many inputs (e.g., cerebral cortex, limbic system, visceral organs) about conditions that deviate from an ideal homeostatic state (e.g., alarming sensory stimulus, emotionally charged event, energy deficiency), this can be interpreted as the initiation step of the stress-response cascade. The hypothalamus is stimulated by its inputs and then proceeds to secrete corticotropin-releasing hormones. This hormone is transported to its target, the pituitary gland, via the hypophyseal portal system (short blood vessels system), to which it binds and causes the pituitary gland to, in turn, secrete its own messenger, adrenocorticotropic hormone, systemically into the body's blood stream. When adrenocorticotropic hormone reaches and binds to its target, the adrenal gland, the adrenal gland in turn releases the final key messenger in the cascade, cortisol. 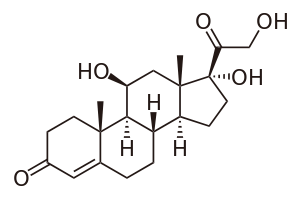 Cortisol, once released, has widespread effects in the body. During an alarming situation in which a threat is detected and signaled to the hypothalamus from primary sensory and limbic structures, cortisol is one way the brain instructs the body to attempt to regain homeostasis – by redistributing energy (glucose) to areas of the body that need it most, that is, toward critical organs (the heart, the brain) and away from digestive and reproductive organs, during a potentially harmful situation in an attempt to overcome the challenge at hand. After enough cortisol has been secreted to best restore homeostasis and the body's stressor is no longer present or the threat is no longer perceived, the heightened levels of cortisol in the body's blood stream eventually circulate to the pituitary gland and hypothalamus to which cortisol can bind and inhibit, essentially turning off the HPA-axis' stress-response cascade via feedback inhibition. This prevents additional cortisol from being released. This is biologically identified as a normal, healthy stress mechanism in response to a situation or stressor – a biological coping mechanism for a threat to homeostasis. It is when the body's HPA-axis cannot overcome a challenge and/or is chronically exposed to a threat that this system becomes overtaxed and can be harmful to the body and brain. A second major effect of cortisol is to suppress the body's immune system during a stressful situation, again, for the purpose of redistributing metabolic resources primarily to fight-or-flight organs. While not a major risk to the body if only for a short period of time, if under chronic stress, the body becomes exceptionally vulnerable to immune system attacks. This is a biologically negative consequence of an exposure to a severe stressor and can be interpreted as stress in and of itself – a detrimental inability of biological mechanisms to effectively adapt to the changes in homeostasis. Stress is the body's reaction to any stimuli that disturbs its equilibrium. When the equilibrium of various hormones is altered the effect of these changes can be detrimental to the immune system. Much research has shown a negative effect stress has on the immune system, mostly through studies where participants were subjected to a variety of viruses. In one study individuals caring for a spouse with dementia, representing the stress group, saw a significant decrease in immune response when given an influenza-virus vaccine compared to a non-stressed control group. A similar study was conducted using a respiratory virus. Participants were infected with the virus and given a stress index. Results showed that an increase in score on the stress index correlated with greater severity of cold symptoms. Studies with HIV have also shown stress to speed up viral progression. Men with HIV were 2–3 times more likely to develop AIDS when under above average stress. Stress affects the immune system in many ways. The immune system protects the body from viruses, bacteria, and anything that is different or that the body does not recognize. The immune system sees these as intruders and it sends messages to attack. The white blood cells, leukocytes, are very important to the immune system. White blood cells have several types including B cells, T cells, and natural killer cells. B cells secrete antibodies. T cells attack intruders and natural killer cells attack cells that have been infected by viruses. These leukocytes produce cytokines which fight infections. But they also are the immune systems communicator in telling the brain that the body is ill. When an individual is stressed or going through a stressful experience the immune system starts to produce natural killer cells and cytokines. When levels of cytokines are higher they combat infections and therefore the brain gets communicated the body is ill and it produces symptoms as if the individual was ill. These symptoms include fever, sleepiness, lack of energy, no appetite, and basically flu like symptoms. These symptoms mean the body is fighting the illness or virus. This is useful for when the body goes through the stress from an injury. But the body has now evolved to do this process during stressful events such as taking exams, or even going through a life changing event such as a death of a family member or a divorce. That is why many times when individuals are stressed because of life changing events or situations such as those, they get these symptoms and believe they are sick when in reality it can be because the body is under stress. Chronic stress is defined as a "state of prolonged tension from internal or external stressors, which may cause various physical manifestations – e.g., asthma, back pain, arrhythmias, fatigue, headaches, HTN, irritable bowel syndrome, ulcers, and suppress the immune system". Chronic stress takes a more significant toll on the body than acute stress does. It can raise blood pressure, increase the risk of heart attack and stroke, increase vulnerability to anxiety and depression, contribute to infertility, and hasten the aging process. For example, results of one study demonstrated that individuals who reported relationship conflict lasting one month or longer have a greater risk of developing illness and show slower wound healing. Similarly, the effects that acute stressors have on the immune system may be increased when there is perceived stress and/or anxiety due to other events. For example, students who are taking exams show weaker immune responses if they also report stress due to daily hassles. While responses to acute stressors typically do not impose a health burden on young, healthy individuals, chronic stress in older or unhealthy individuals may have long-term effects that are detrimental to health. Studies revealing the relationship between the immune system and the central nervous system indicate that stress can alter the function of the white blood cells involved in immune function known as lymphocytes and macrophages. People undergoing stressful life events, such as marital turmoil or bereavement, have a weaker lymphoproliferative response. People in distressed marriages have also been shown to have greater decreases in cellular immunity functioning over time when compared to those in happier marriages. After antigens initiate an immune response, these white blood cells send signals, composed of cytokines and other hormonal proteins, to the brain and neuroendocrine system. Cytokines are molecules involved with cell signaling. Cortisol, a hormone released during stressful situations, affects the immune system greatly by preventing the production of cytokines. During chronic stress, cortisol is over produced, causing fewer receptors to be produced on immune cells so that inflammation cannot be ended. A study involving cancer patient's parents confirmed this finding. Blood samples were taken from the participants. Researchers treated the samples of the parents of cancer patients with a cortisol-like substance and stimulated cytokine production. Cancer patient parents' blood was significantly less effective at stopping cytokine from being produced. Chronic stress is seen to affect the parts of the brain where memories are processed through and stored. When people feel stressed, stress hormones get over-secreted, which affects the brain. This secretion is made up of glucocorticoids, including cortisol, which are steroid hormones that the adrenal gland releases, although this can increase storage of flashbulb memories it decreases long-term potentation (LTP). Prolonged Stress can also be harmful to our body. That is because stress releases cortisol, and cortisol causes metabolic activity throughout the body. Metabolic activity is raised in the hippocampus. Overstimulation and toxins then are more likely to kill or damage neurons in the hippocampus. The hippocampus is important in the brain for storing certain kinds of memories and damage to the hippocampus can cause trouble in storing new memories but old memories, memories stored before the damage, are not lost. Also high cortisol levels can be tied to the deterioration of the hippocampus and decline of memory that many older adults start to experience with age. A study was done and it showed that the power of having support from a loved one or just social support, lowered stress in the individuals. They gave painful shocks to married women's ankles. On some trials women were able to hold their husbands hand, on other trials they held a strangers hand, and then held no one's hand. When the women were holding their husbands hand, the response reduced in many brain areas. When holding the strangers hand the response reduced a little but not as much as when they were holding their husbands hand. Social support helps reduce stress but even more if the support is from a loved one. Measuring stress levels independent of differences in people's personalities has been inherently difficult: Some people are able to process many stressors simultaneously, while others can barely address a few. Such tests as the Trier Social Stress Test attempted to isolate the effects of personalities on ability to handle stress in a laboratory environment. Other psychologists, however, proposed measuring stress indirectly, through self-tests. Because the amount of stressors in a person's life often (although not always) correlates with the amount of stress that person experiences, researchers combine the results of stress and burnout self-tests. Stress tests help determine the number of stressors in a person's life, while burnout tests determine the degree to which the person is close to the state of burnout. Combining both helps researchers gauge how likely additional stressors will make him or her experience mental exhaustion. During passive activity, patients with generalised anxiety disorder (GAD) exhibit increased metabolic rates in the occipital, temporal and frontal lobes and in the cerebellum and thalamus compared with healthy controls. Increased metabolic activity in the basal ganglia has also been reported in patients with GAD during vigilance tasks. These finding suggest that there may be hyperactive brain circuits in GAD. Patients with generalised anxiety disorder (GAD) exhibit increased metabolic rates in several brain regions compared with healthy controls. Hyperactive neurotransmitter circuits between the cortex, thalamus, amygdala and hypothalamus have been implicated in the disorder. Hypofunction of serotonergic neurones arising from the dorsal raphe nucleus and GABAergic neurones that are widely distributed in the brain may result in a lack of inhibitory effect on the putative GAD pathway. Furthermore, overactivity of noradrenergic neurones arising from the locus coeruleus may produce excessive excitation in the brain areas implicated in GAD. Based on early neuroanatomical observations and studies with psychoactive drugs, the septohippocampal circuit has been proposed as a model for anxiety disorders. The circuit that links the septum, amygdala, hippocampus and fornix is thought to process external stimuli and regulate the behavioural response through wider projections in the brain. Hyperstimulation of this putative ‘behavioural inhibition' circuit, through dysfunctional noradrenergic and serotonergic neurotransmission, has been implicated in producing anxiety, and increased arousal and attention. In generalised anxiety disorder (GAD) there is increased noradrenaline transmission from both the locus coeruleus and the caudal raphe nuclei. The locus coeruleus-noradrenaline system is associated with anxiety and may mediate the autonomic symptoms associated with stress such as increased heart rate, dilated pupils, tremour and sweating. Serotonergic nuclei are found in the rostral and caudal raphe nuclei. Neurones ascend from the rostral raphe nuclei to the cerebral cortex, limbic regions and basal ganglia. The activity of neurones innervating the pre-frontal cortex, basal ganglia and limbic region is decreased in generalised anxiety disorder (GAD). The activity of descending neurones from serotonergic nuclei in the brainstem is unaffected in GAD. This altered neurotransmitter balance contributes towards the feeling of anxiety associated with GAD. GABA is the main inhibitory neurotransmitter in the central nervous system (CNS). GABAergic inhibition is seen at all levels of the CNS, including the hypothalamus, hippocampus, cerebral cortex and cerebellar cortex. The activity of GABAergic neurones is decreased in generalised anxiety disorder. There are a number of areas of the brain affected in panic disorder. Decreased serotonin activity in the amygdala and frontal cortex induces symptoms of anxiety, whereas decreased activity in the periaqueductal gray results in defensive behaviours and postural freezing. The locus coeruleus increases norepinephrine release mediating physiological and behavioural arousal, while the hypothalamus mediates the sympathetic nervous system. Hyperactive neurotransmitter circuits between the cortex, thalamus, hippocampus, amygdala, hypothalamus and periaqueductal gray matter have been implicated in panic disorder. Hypofunction of serotonergic neurones arising from the rostral raphe nucleus may result in a lack of inhibitory effect on the putative panic pathways in the brain. While, overactivity of norepinephrine neurons arising from the locus coeruleus may produce excessive excitation in the regions implicated in panic disorder. Physiological symptoms of the panic response are medicated by the autonomic nervous system through connections with the locus coeruleus and hypothalamus. The principal serotonin centres in the brain are the caudal and rostral raphe nuclei. Transmission of serotonin from the rostral raphe nuclei to the pre-aquaductal grey, amygdala, temporal lobe and limbic cortex is decreased in panic disorder compared with normal. Serotonin transmission to other target regions of the brain remain unchanged. In panic disorder there is increased norepinephrine transmission from both the locus coeruleus and the caudal raphe nuclei. The locus coeruleus-norepinephrine system may have a significant role in processing fear-related stimuli or it may affect fear-related processing by stimulating other regions of the brain implicated in anxiety and fear behaviours i.e. amygdala, hippocampus, hypothalamus, cortex and spinal cord. Physiologists define stress as how the body reacts to a stressor, real or imagined, a stimulus that causes stress. Acute stressors affect an organism in the short term; chronic stressors over the longer term. General Adaptation Syndrome (GAS), developed by Hans Selye, is a profile of how organisms respond to stress; GAS is characterized by three phases: a nonspecific mobilization phase, which promotes sympathetic nervous system activity; a resistance phase, during which the organism makes efforts to cope with the threat; and an exhaustion phase, which occurs if the organism fails to overcome the threat and depletes its physiological resources. Antishock phase: When the threat or stressor is identified or realized, the body starts to respond and is in a state of alarm. During this stage, the locus coeruleus/sympathetic nervous system is activated and catecholamines such as adrenaline are being produced, hence the fight-or-flight response. The result is: increased muscular tonus, increased blood pressure due to peripheral vasoconstriction and tachycardia, and increased glucose in blood. There is also some activation of the HPA axis, producing glucocorticoids (cortisol, aka the S-hormone or stress-hormone). Resistance is the second stage and increased secretion of glucocorticoids play a major role, intensifying the systemic response—they have lipolytic, catabolic and antianabolic effects: increased glucose, fat and aminoacid/protein concentration in blood. Moreover, they cause lymphocytopenia, eosinopenia, neutrophilia and polycythemia. In high doses, cortisol begins to act as a mineralocorticoid (aldosterone) and brings the body to a state similar to hyperaldosteronism. If the stressor persists, it becomes necessary to attempt some means of coping with the stress. Although the body begins to try to adapt to the strains or demands of the environment, the body cannot keep this up indefinitely, so its resources are gradually depleted. The result can manifest itself in obvious illnesses, such as peptic ulcer and general trouble with the digestive system (e.g. occult bleeding, melena, constipation/obstipation), diabetes, or even cardiovascular problems (angina pectoris), along with clinical depression and other mental illnesses. There are a number of areas of the brain affected in phobia. Activation of the amygdala causes anticipatory anxiety or avoidance (conditioned fear) while activation of the hypothalamus activates the sympathetic nervous system. Other regions of the brain involved in phobia include the thalamus and the cortical structures, which may form a key neural network along with the amygdala. Stimulation of the locus coeruleus increases noradrenaline release mediating physiological and behavioural arousal. One hypothesis about the biological basis of phobia suggests that there is an excess of noradrenaline in the principal noradrenergic pathways in the brain and that this causes a down-regulation of post-synaptic adrenergic receptors. Transmission of noradrenaline from the caudal raphe nuclei and the locus coeruleus is increased in phobia. The principal centres in the brain are the caudal and rostral raphe nuclei. Transmission of serotonin from the rostral raphe nuclei to the thalamus, limbic cortex and cerebral cortex is decreased in phobia compared with normal. The other major pathways for serotonin transmission which involve the basal ganglia and cerebellum, and project down the spinal cord, remain unchanged. PTSD is a severe anxiety disorder that can develop after exposure to any event that results in psychological trauma. This event may involve the threat of death to oneself or to someone else, or to one's own or someone else's physical, sexual, or psychological integrity, overwhelming the individual's ability to cope. As an effect of psychological trauma, PTSD is less frequent and more enduring than the more commonly seen acute stress response. Diagnostic symptoms for PTSD include intrusion, avoidance and hyperarousal -- re-experiencing the original trauma(s) through "flashbacks" or nightmares (intrusion), emotional numbing or avoidance of stimuli associated with the trauma, and increased arousal, such as difficulty falling or staying asleep, anger, and hypervigilance. Formal diagnostic criteria (both DSM-IV-TR and ICD-10) require that the symptoms last more than one month and cause significant impairment in social, occupational, or other important areas of functioning. Sensory input, memory formation and stress response mechanisms are affected in people with PTSD. The regions of the brain involved in memory processing that are implicated in PTSD include the hippocampus, amygdala and frontal cortex. While the heightened stress response is likely to involve the thalamus, hypothalamus and locus coeruleus. There is consistent evidence from MRI volumetric studies that hippocampal volume is reduced in posttraumatic stress disorder (PTSD). This atrophy of the hippocampus is thought to represent decreased neuronal density. However, other studies suggest that hippocampal changes are explained by whole brain atrophy and generalised white matter atrophy is exhibited by people with PTSD. In depression, the hypothalamic-pituitary-adrenal (HPA) axis is upregulated with a down-regulation of its negative feedback controls. Corticotropin-releasing factor (CRF) is hypersecreted from the hypothalamus and induces the release of adrenocorticotropin hormone (ACTH) from the pituitary. ACTH interacts with receptors on adrenocortical cells and cortisol is released from the adrenal glands; adrenal hypertrophy can also occur. Release of cortisol into the circulation has a number of effects, including elevation of blood glucose. The negative feedback of cortisol to the hypothalamus, pituitary and immune system is impaired. This leads to continual activation of the HPA axis and excess cortisol release. Cortisol receptors become desensitized leading to increased activity of the pro-inflammatory immune mediators and disturbances in neurotransmitter transmission. The current usage of the word stress arose out of Selye's 1930s experiments. He started to use the term to refer not just to the agent but to the state of the organism as it responded and adapted to the environment. His theories of a universal non-specific stress response attracted great interest and contention in academic physiology and he undertook extensive research programs and publication efforts. From the late 1960s, academic psychologists started to adopt Selye's concept; they sought to quantify "life stress" by scoring "significant life events," and a large amount of research was undertaken to examine links between stress and disease of all kinds. By the late 1970s, stress had become the medical area of greatest concern to the general population, and more basic research was called for to better address the issue. There was also renewed laboratory research into the neuroendocrine, molecular, and immunological bases of stress, conceived as a useful heuristic not necessarily tied to Selye's original hypotheses. The US military became a key center of stress research, attempting to understand and reduce combat neurosis and psychiatric casualties. By the 1990s, "stress" had become an integral part of modern scientific understanding in all areas of physiology and human functioning, and one of the great metaphors of Western life. Focus grew on stress in certain settings, such as workplace stress, and stress management techniques were developed. The term also became a euphemism, a way of referring to problems and eliciting sympathy without being explicitly confessional, just "stressed out." It came to cover a huge range of phenomena from mild irritation to the kind of severe problems that might result in a real breakdown of health. In popular usage, almost any event or situation between these extremes could be described as stressful. 1 2 3 Schneiderman, N.; Ironson, G.; Siegel, S. D. (2005). "Stress and health: psychological, behavioral, and biological determinants". Annual Review of Clinical Psychology. 1: 607–628. doi:10.1146/annurev.clinpsy.1.102803.144141. ↑ Herbert, T. B.; Cohen, S. (1993). "Stress and immunity in humans: a meta-analytic review". Psychosomatic Medicine. 55 (4): 364–379. doi:10.1097/00006842-199307000-00004. ↑ Selye H (1938). "Adaptation Energy". Nature. 141 (3577): 926. doi:10.1038/141926a0. ↑ Greubel, Jana and Kecklund, Göran. The Impact of Organizational Changes on Work Stress, Sleep, Recovery and Health. Industrial Health. Department for Psychology, University of Fribourg. ↑ Jeronimus, B.F.; Riese, H.; Sanderman, R.; Ormel, J. (2014). "Mutual Reinforcement Between Neuroticism and Life Experiences: A Five-Wave, 16-Year Study to Test Reciprocal Causation". Journal of Personality and Social Psychology. 107 (4): 751–64. doi:10.1037/a0037009. ↑ Schlotz W, Yim IS, Zoccola PM, Jansen L, Schulz P (2011). The perceived stress reactivity scale: Measurement invariance, stability, and validity in three countries. Psychol Assess. (pp. 80–94). ↑ Pinquart M.; Sörensen S. (2003). "Differences between caregivers and noncaregivers in psychological health and physical health: a meta-analysis". Psychology and aging. 18 (2): 250–267. doi:10.1037/0882-7974.18.2.250. ↑ Kobasa, S. C. (1982). The Hardy Personality: Toward a Social Psychology of Stress and Health. In G. S. Sanders & J. Suls (Eds. ), Social Psychology of Health and Illness (pp. 1–25). Hillsdale, NJ: Lawrence Erlbaum Assoc. 1 2 Cohen, S; Janicki-Deverts, D; Miller, GE. (2007). "Psychological Stress and Disease" (PDF). JAMA. 298 (14): 1685–1687. doi:10.1001/jama.298.14.1685. PMID 17925521. ↑ Miller, G.; Chen, E.; Cole, S. W. (2009). "Health psychology: Developing biologically plausible models linking the social world and physical health". Annual Review of Psychology. 60: 501–524. doi:10.1146/annurev.psych.60.110707.163551. ↑ Yehuda R.; Halligan S. L.; Bierer L. M. (2001). "Relationship of parental trauma exposure and ptsd to ptsd, depressive and anxiety disorders in offspring". Journal of Psychiatric Research. 35: 261–270. doi:10.1016/s0022-3956(01)00032-2. 1 2 Keil R.M.K. (2004). "Coping and Stress: A Conceptual Analysis". Journal of Advanced Nursing. 45 (6): 659–665. doi:10.1046/j.1365-2648.2003.02955.x. ↑ W. B. Cannon; Physiological Regulation of Normal States: Some Tentative Postulates Concerning Biological Homeostatics; IN: A. Pettit (ed. ); A Charles Richet: ses amis, ses collègues, ses élèves; p. 91; Paris; Éditions Médicales; 1926. ↑ Viner, Russell (June 1999). "Putting Stress in Life: Hans Selye and the Making of Stress Theory". Social Studies of Science. 29 (3): 391–410. doi:10.1177/030631299029003003. ISSN 1460-3659. JSTOR 285410. ↑ Goldstein, David S.; Kopin, Irwin J. (January 2007). "Evolution of concepts of stress". Stress: The International Journal on the Biology of Stress. 10 (2): 109–120. doi:10.1080/10253890701288935. PMID 17514579. ↑ Dattatreya, Shruthi (2014). "Can Stress Take the Cost of Life". SSRN Electronic Journal. doi:10.2139/ssrn.2456211. ↑ Worthington, James. "Six ways to spot emotional manipulation before it destroys you". The Fusion Model. Retrieved 19 April 2015. ↑ Selye, Hans (1978). The stress of life (Rev. ed.). New York: McGraw-Hill. ISBN 9780070562127. ↑ Koolhaas J, et al. (2011). "Stress revisited: A critical evaluation of the stress concept". Neuroscience and Biobehavioral Reviews. 35 (5): 1291–1301. doi:10.1016/j.neubiorev.2011.02.003. ↑ Schacter, Daniel L.; Gilbert, Daniel T.; Wegner, Daniel M. (2011). Psychology (2nd ed.). New York: Worth Publishers. p. 13.7. ISBN 1429237198. ↑ Ulrich-Lai, Y. M.; Herman, J. P. (2009). "Neural regulation of endocrine and autonomic stress responses". Nature Reviews Neuroscience. 10 (6): 397–409. doi:10.1038/nrn2647. PMID 19469025. ↑ O'Connor, T. M.; O'Halloran, D. J.; Shanahan, F. (2000). "The stress response and the hypothalamic-pituitary-adrenal axis: From molecule to melancholia". QJM : monthly journal of the Association of Physicians. 93 (6): 323–333. doi:10.1093/qjmed/93.6.323. PMID 10873181. ↑ Roozendaal, B.; McEwen, B. S.; Chattarji, S. (2009). "Stress, memory and the amygdala". Nature Reviews Neuroscience. 10 (6): 423–433. doi:10.1038/nrn2651. PMID 19469026. ↑ Maras, P. M.; Baram, T. Z. (2012). "Sculpting the hippocampus from within: Stress, spines, and CRH". Trends in Neurosciences. 35 (5): 315–324. doi:10.1016/j.tins.2012.01.005. PMC 3423222 . PMID 22386641. ↑ McEwen, B. S. (2012). "Brain on stress: How the social environment gets under the skin". Proceedings of the National Academy of Sciences. 109 (Suppl 2): 17180–17185. doi:10.1073/pnas.1121254109. PMC 3477378 . PMID 23045648. ↑ McEwen, B. S.; Morrison, J. H. (2013). "The Brain on Stress: Vulnerability and Plasticity of the Prefrontal Cortex over the Life Course". Neuron. 79 (1): 16–29. doi:10.1016/j.neuron.2013.06.028. PMC 3753223 . PMID 23849196. ↑ Arnsten, A. F. T. (2009). "Stress signalling pathways that impair prefrontal cortex structure and function". Nature Reviews Neuroscience. 10 (6): 410–422. doi:10.1038/nrn2648. PMC 2907136 . PMID 19455173. ↑ Kaufman, Joan; Plotsky, Paul M; Nemeroff, Charles B; Charney, Dennis S (October 2000). "Effects of early adverse experiences on brain structure and function: clinical implications". Biological Psychiatry. 48 (8): 778–790. doi:10.1016/S0006-3223(00)00998-7. ↑ Cortisol; Drexel Med; retrieved . ↑ Urban Janice; et al. (2008). "Neuropeptide Y in the Amygdala Induces Long-Term Resilience to Stress-Induced Reductions in Social Responses But Not Hypothalamic–Adrenal–Pituitary Axis Activity or Hyperthermia". The Journal of Neuroscience. 28 (4): 893–903. doi:10.1523/JNEUROSCI.0659-07.2008. 1 2 3 4 5 Khansari D.; Murgo A.; Faith R. (May 1990). "Effects of stress on the immune system". Immunology Today. 11 (5): 170–175. doi:10.1016/0167-5699(90)90069-l. PMID 2186751. ↑ Kemeny M. E. (2007). "Understanding the interaction between psychosocial stress and immune-related diseases: A stepwise progression". Brain, Behavior, and Immunity. 21 (8): 1009–1018. doi:10.1016/j.bbi.2007.07.010. 1 2 Graham J.; Christian L.; Kiecolt-Glaser J. (2006). "Stress, Age, and Immune Function: Toward a Lifespan Approach". Journal of Behavioral Medicine. 29 (4): 389–400. doi:10.1007/s10865-006-9057-4. ↑ Schneiderman N.; Ironson G.; Siegel S. D. (2005). "Stress and health: psychological, behavioral, and biological determinants". Annual Review of Clinical Psychology. 1 (1): 607–628. doi:10.1146/annurev.clinpsy.1.102803.144141. ↑ Jaremka L. M.; Glaser R.; Malarkey W. B.; Kiecolt-Glaser J. K. (2013). "Marital distress prospectively predicts poorer cellular immune function". Psychoneuroendocrinology. 38 (11): 2713–2719. doi:10.1016/j.psyneuen.2013.06.031. ↑ Dantzer R.; Kelley K. (1989). "Stress and immunity: An integrated view of relationships between the brain and the immune system". Life Sciences. 44 (26): 1995–2008. doi:10.1016/0024-3205(89)90345-7. ↑ Glaser R.; Kiecolt-Glaser J. K. (2005). "Stress-induced immune dysfunction: Implications for health". Immunology. 5 (3): 243–251. doi:10.1038/nri1571. ↑ "Renew-Stress on the Brain". The Franklin Institute. ↑ Selye (1975). "Confusion and controversy in the stress field". Journal of Human Stress. 1 (2): 37–44. doi:10.1080/0097840X.1975.9940406. PMID 1235113. ↑ de Kloet, E. Ron; Joëls, Marian; Holsboer, Florian (June 2005). "Stress and the brain: from adaptation to disease". Nature Reviews Neuroscience. 6 (6): 463–475. doi:10.1038/nrn1683. PMID 15891777. ↑ "The Silent Denial of Stress in a Competitive World". The Silent Denial of Stress in a Competitive World. 2012-03-17. Retrieved 2012-03-17. ↑ Lazarus, R.S. (1966). Psychological Stress and the Coping Process. New York: McGraw-Hill. ↑ Aldwin, Carolyn (2007). Stress, Coping, and Development, Second Edition. New York: The Guilford Press. ISBN 1-57230-840-0. ↑ Shankar, A.A.; Dandekar, R.C. "Assessment of stress in patients with Recurrent Aphthous Stomatitis, by salivary alpha amylase using a Cocorometer" dissertation submitted for Oral Pathology to Maharashtra University of Health Sciences, Nashik in December 2009. ↑ Truby, William; "Stress Test", Stress Test: A self assessment, December, 2009. ↑ Glavas, M.M. ; Weinberg, J. (2006). "Stress, Alcohol Consumption, and the Hypothalamic-Pituitary-Adrenal Axis". In Yehuda, S.; Mostofsky, D.I. Nutrients, Stress, and Medical Disorders. Totowa, NJ: Humana Press. pp. 165–183. ISBN 978-1-58829-432-6. ↑ Schore, Allan (2003). Affect Regulation & the Repair of the Self. New York: W.W. Norton. ISBN 0-393-70407-6. ↑ J Clin Psychiatry 2001;62 (Suppl. 11):22–27. ↑ Anxiolytics and sedative-hypnotics. In: Essential Psychopharmacology. Neuroscientific basis and practical applications. Stahl S. Cambridge, UK: Cambridge University Press, 1996: 167–215. ↑ Psychiatr Clin North Am 2001;21:75–97. ↑ J Clin Psychiatry 2001;62:22–27. 1 2 3 "Neuroanatomical Hypothesis of Panic Disorder, Revised". Am J Psychiatry. 157: 493–505. 2000. doi:10.1176/appi.ajp.157.4.493. 1 2 Current Opinions in Neurobiology 2000;10:211–218. ↑ Gozhenko, AI; Gurkalova, IP; Zukow, W; Kwasnik, Z; Mroczkowska, B. Gozhenko, AI; Zukow, W; Kwasnik, Z, eds. Pathology: Medical student's library. Radom University. p. 272. ISBN 978-83-61047-18-6. OCLC 750538315. 1 2 Drug treatments for obsessive compulsive disorder, panic disorder, and phobia. In: Essential Psychopharmacology. Neuroscientific basis and practical applications. Stahl S. Cambridge, UK: Cambridge University Press, 1996: 216–248. ↑ Semin Clin Neuropsychiatry 2001;6:113–145. ↑ Depression. What happens in the brain? www.brainexplorer.org Accessed 20 May 2002. ↑ Primary Care Companion J Clin Psychiatry 2001;3:151–155. ↑ Br Med Bull 1996;52:597–617. ↑ Neural plasticity and disorders of the nervous system. In: Neuroscience at a glance, Barker RA and Barasi S with Neal MJ. London, England, 1999:105–121. ↑ Neurotransmitters and psychiatric disorders. In: Psychiatric disorders with a biochemical basis. Donaldson D. Carnthorn, UK: The Parthenon Publishing Group Inc, 1998: 45–55. 1 2 3 4 Viner R (1999). "Putting Stress in Life: Hans Selye and the Making of Stress Theory". Social Studies of Science. 29 (3): 391–410. doi:10.1177/030631299029003003. JSTOR 285410. ↑ Shalev, Arieh Y.; Yehuda, Rachel; Alexander C. McFarlane (2000). International handbook of human response to trauma. New York: Kluwer Academic/Plenum Press. ISBN 0-306-46095-5. ; on-line. Carlson, N.R. & Heth, C.D. (2007). ','Psychology the science of behaviour. 4th ed. Upper Saddle River, New Jersey: Pearson Education, Inc., 527. Holmes T.H. ; Rahe R.H. (1967). "The social readjustments rating scales". Journal of Psychosomatic Research. 11 (2): 213–218. doi:10.1016/0022-3999(67)90010-4. PMID 6059863. Renner Katherine H (2010). "Effects of Naturalistic Stressors on Cognitive Flexibility and Working Memory Task Performance". Neurocase. 16 (4): 293–300. doi:10.1080/13554790903463601.